same as last year, I participated in the Chabre Open. It’s a great Fun Comp and always very quickly fully booked (this year in 11 minutes!). A lot of Britisch, Dutch, France pilots but also some German, Scandinavian and this year two Australian pilots attended. The pilots are a mix from rookies to very experianced pilots. It all starts with safety briefings, and a test task on Saturday. Sunday is the first day to race and the task usually are arround 45-80 km. This year, the first day was a race of about 80 km. The weather was typical for that region and the race went very well. Start on Chabre ridge and finisch in Chorges. I came in 3rd – a great start for the event! 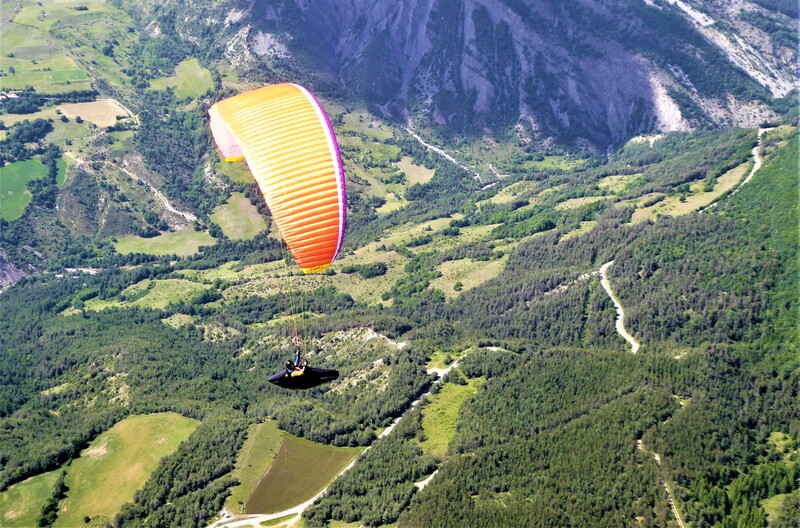 The second Task: 65 kilometers in the same direction but with the landing in “Le Batie Neuve”. It was a bit more stable and a completely different day then the first task. As my instruments gave me a “go” for the final glide, I faced a lot more sink then expected. Was the valley yesterday great, today it did nothing. I bombed out about 2 km before goal. What a disaster. The third task was cancelled. The fourth task was a short one: threatning over-development made us decide (I was member of the pilots task committee) to do a short fast race. And fast it was – at least for me. I came in first with almost 8 minutes lead on rank two thanks to a hudge climb above Col ‘d Ajoure. Thursday and friday the wind was to strong. So finally I got stucked on 7th place overall and 4th in X-class. The big question: TRITON 2 or the new SECTOR? As you may know, I have been flying the TRITON and TRITON 2 for many years and I was doubting very much if I should keep on flying the TRITON 2 or the new SECTOR. I decided to go for the Sector. It arrived two days before the comp and after the first day of flying (before the comp), I was still unsure about the two options. The TRITON “looks a lot faster”. But at that time there were no other pilots arround to compare with. During the test task I could finally see what the SECTOR can do against gliders as the Delta 3 and Sigma 10. Well to be short. It’s impressive!! Speed: more ore less equal with these competitors and a lot faster than the other brands. Behavior: just great! No big colapses (even on full bar) and only very mild the tips sometimes rolled in. Conclusion: A really fantastic wing with a high passive safety potential. that is when 2 km make the difference between overall winner and rank 7. Still a stunning performance. Well done!